Every year Canadians from coast to coast celebrate the Canada Day. We as Bangali Canadians are proud of being the part of this celebration. 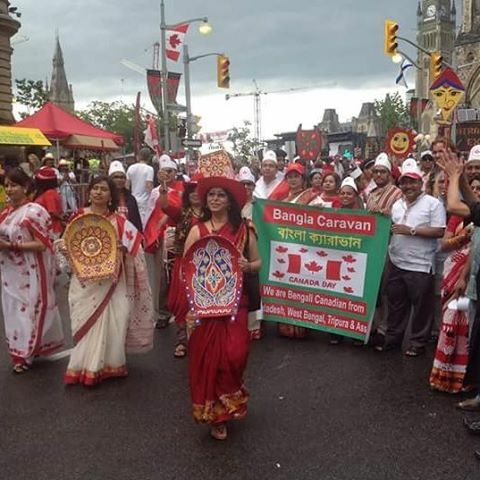 This year also we tried to bring more joy and color to Canada Day displaying to our fellow Canadians our rich Bangali cultural heritage in a collective way that would enrich the glorifying values of Canadian multi-cultural society. Bangla Caravan 2016 is an initiative to share rich Bangali culture and heritage with the members of Canadian multicultural mosaic. This is a unique opportunity, where anyone from Bangali culture can demonstrate and share her or his cultural performances to the greater Canadian community to show and celebrate the diverse treasure that we all bring with us. Everybody joined us with any Bangali outfit (punjabi, paijama, lungi, sari of various kind dressed in various styles, dhuti, gamsa, baul dress, manipuri dress, indigenous people’s dress, faith based dress prevalent in Bangali society, wedding dress, or any dress of your choice from Bangali culture), musical instruments, dance costumes, handicrafts, pictures, banners, festoons, garlands etc etc to celebrate a wonderful, colorful and an enjoyable Canada Day with your family and friends! started our Bangla Caravan at 2:30 pm from Rideau Centre and will display on the street and in the downtown parliament area until 5:00pm. Proactive Education for all Children’s Enrichment this year will implement a project as part of Multicultural Community Capacity Grant Program under the Ministry of Citizenship and Immigration. This initiative provides funding to non-profit organizations that focuses on newcomers and ethno-cultural groups for projects that promote diversity and inclusion. In the project, Proactive Education for all Children’s Enrichment will collaborate with number of schools in the Ottawa Vanier area, and work with children’s from new immigrant families. Through workshops and focus group sessions, approximately 30-40 children would be provided an understanding of multilingualism. Later through a group exercise these children will create a language tree where they would display various words in their own languages. Through this initiative we aim to create a cultural bonding between the groups and showcase to diverse stakeholders the importance of multilingualism in the education. Multilingualism greatly contributes to strengthening the Canadian Multicultural Mosaic and also helps in the integration for the newcomers.